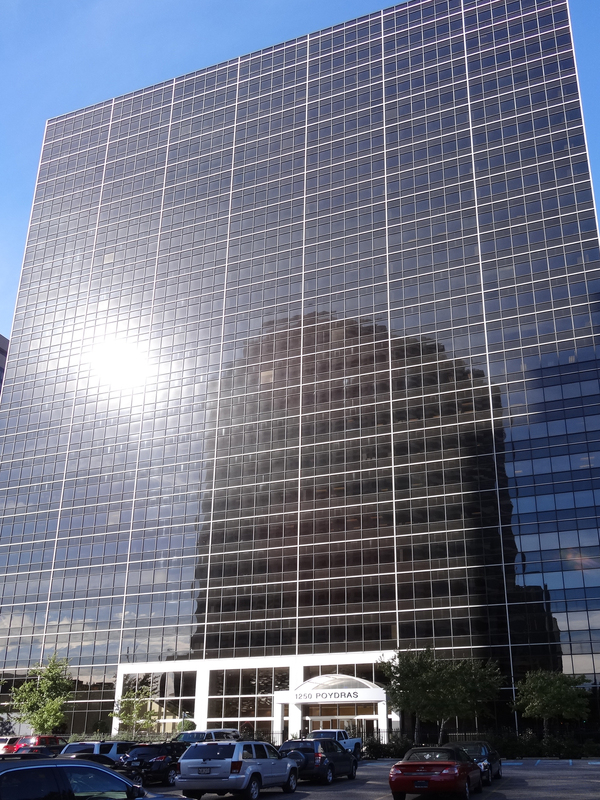 The largest contiguous Class A office tower space for lease in New Orleans’ CBD is now available, according to Robert Hand, president of Louisiana Commercial Realty, who is co-marketing the office space with Maria McLellan, Associate Broker of Corporate Services with Gulf States Real Estate Services, LLC. 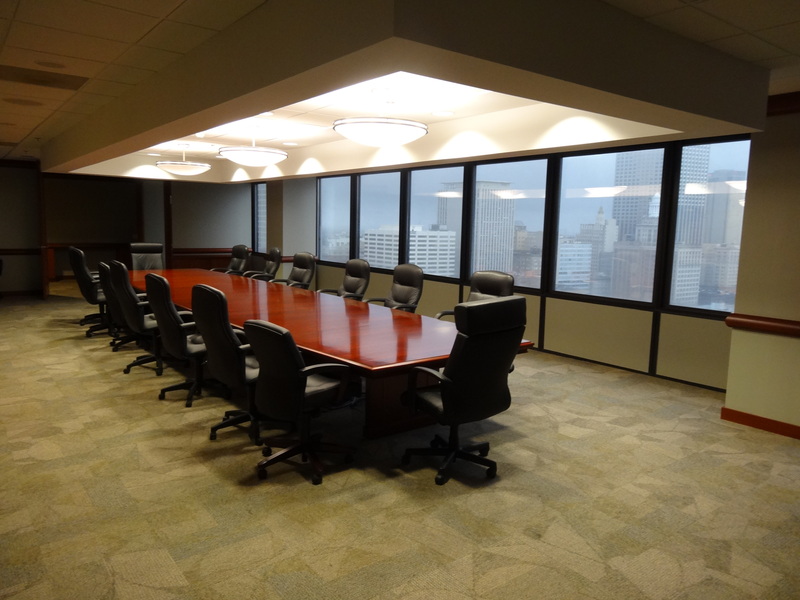 The space encompasses four full floors at 1250 Poydras Street, located on the corner of Loyola Avenue and Poydras Street, in downtown New Orleans. The office space is available for sublease until October 31, 2018. 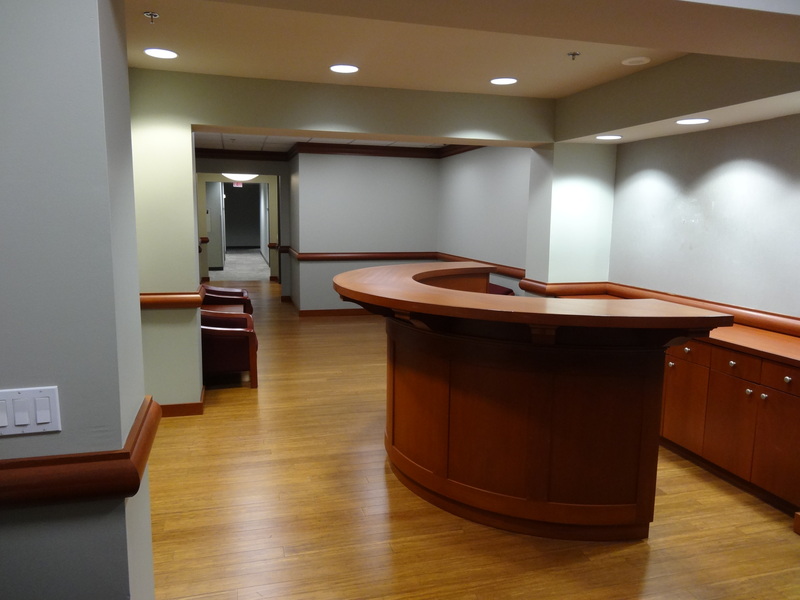 “The space is strategically located in the center of all the new and exciting activity in downtown New Orleans. It is next door to Champion’s Square and the Superdome, across the street from City Hall and the new $200 million dollar South Market mixed-use development, adjacent to the $275 million dollar Hyatt Hotel, on the new Loyola Avenue streetcar line and near the 45 story 1001 Howard | Plaza Tower $100 million dollar redevelopment. There’s more activity in this area than anywhere else in downtown New Orleans,” said Robert Hand, president of Louisiana Commercial Realty. McLellan believes the office space will be leased by a new industry relocating to Louisiana, and is targeting the digital media industry. New Orleans is an attractive destination for relocating companies because of its dynamic business environment, tax incentives, and world-renowned culture. That was GE Capital’s logic in opening its GE Capital Technology Center in 2012, according to a February 2012 BusinessWire article. “New Orleans has many of the things we need to build a center – a great location, talent, and an attractive business environment,” Brackett Denniston, GE’s senior vice president and general counsel, said. Louisiana’s 35% Digital Interactive Media and Software Development refundable tax credit — the strongest of its kind in the nation — is helping traditional and digital companies of all sizes gain a competitive edge. Provides a 35% rebate on payroll for in-state labor, every year. Offers a 25% tax credit for qualified expenses of hardware and equipment made in Louisiana. The refund is available at the end of each year for 100% of its value claimed on Louisiana state tax return or certified applicants can receive 85% of the value earned as a rebate any time during the year. Development must be for digital media sold as a product. The Enterprise Zone is a jobs incentive program that provides Louisiana income and franchise tax credits to a new or existing business located in Louisiana creating permanent net new full-time jobs, and hiring at least 50% of those net new jobs from one of four targeted groups. The benefit provides a one-time $2,500 job tax credit for each net new job created. A 4% rebate of sales and use taxes paid on qualifying materials, machinery, furniture, and/or equipment purchased or a 1.5% refundable investment tax credit on the total capital investment, excluding tax exempted items. The Research and Development Tax Credit encourages existing businesses with operating facilities in Louisiana to establish or continue research and development activities within the state. Provides up to a 40% tax credit of global payroll on qualified research expenditures incurred in Louisiana — with no cap and no minimum requirement. This Program provides a cash rebate as an incentive to encourage targeted businesses to locate in Louisiana, create quality jobs and promote economic development. The cash rebate is an annual rebate for up to 10 years of 5% of gross annual payroll for hourly wage rates of at least $14.50, or 6% of gross annual payroll for minimum hourly wage rates of $19.50. Additionally, businesses that expand or locate are eligible for a state rebate of 4%, and a local rebate for sales/use taxes paid on equipment, machinery and construction materials. The Competitive Projects Payroll Incentive Program provides, by invitation only, an incentive rebate of up to 15 percent of a participating company’s new payroll for up to 10 years. Additionally, a participating company will be eligible for either a rebate of state sales and use taxes on capital expenditures or 1.5 percent project facility expense rebate. Provides customized workforce recruitment, screening and training to any manufacturing, corporate headquarters, warehouse and distribution, or research and development company, at no cost. 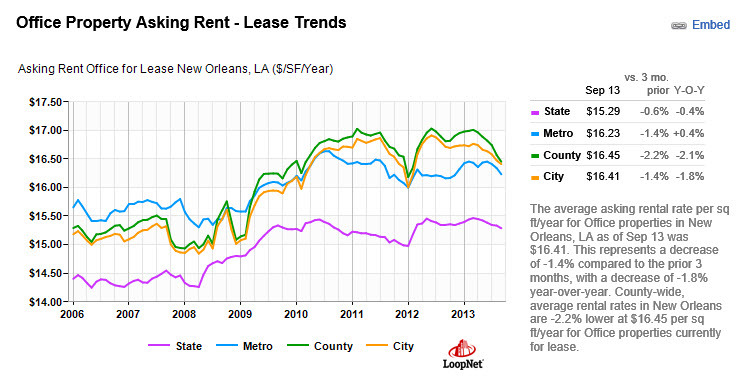 Prices for office space in New Orleans have averaged $16.41 per square foot recently, up from $15.25 in 2006, as shown in the chart below. Louisiana Commercial Realty LLC is renowned for its creative problem solving in marketing high value, complicated commercial properties. 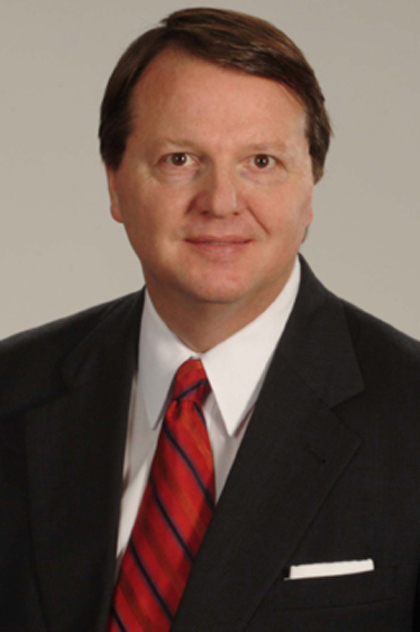 President Robert Hand is the only commercial real estate broker in Louisiana with an MBA and the CCIM and SIOR designations. Gulf States Real Estate Services LLC works with corporate users, land owners, institutional and private investors to identify, acquire, and oversee all aspects of development, leasing, sales, and construction activity. Maria McLellan has twenty years of commercial real estate experience helping national, regional and local companies lease over one million square feet of office space. She offers a comprehensive service including: assessment, market analysis, site inspection, site selection, proposal development, contract negotiation, and managing the entire move-in process.